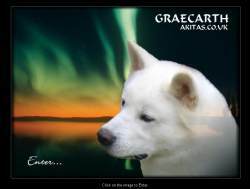 Graecarth did not have a web site or any web presence they approached us with a view to obtaining a new web site to advertise their dogs. Graecarth had no idea what they would like and left all the design elements to us. Initially we discussed the format of the site including it's rough layout and the amount of content to be included. Once we were clear of this we got an idea of favorite or preferred colours of the customer. An additional consideration was the background needed to compliment the dogs. The colours given were greens and oranges, not colours that would normally go together. We looked through a series of images and came up with the skyscape that can be seen on their site. This incorporated the colours required and would not detract from the overall impression of the site. The image was widened to as the original was of insufficient length to form a masthead, but we were careful not to just repeat part of the master image, and we would challenge people to find the seam in the masthead! Then the dogs head and the text were added. The font was chosen for it's clarity but also as it looks slightly japanese in origin and the Akita dog breed has japanese roots. A simple text menu was added with green borders to the content area. This gave the page a feeling of division rather than a large sprawling space. Additionally by us designing a central area into which the content goes we can control the layout easier so that all visitors see the same layout of the site. Each page was added to build up the site, the customer wanted a clean, formal look so this is what we gave them no bells and whistles simply plain edges. As with many of our sites Graecarth requested a guest book which was custom written for them. As automated spamming of guest books and forums is becoming more apparent we added a 'CAPTCHA' ( " Completely Automated Public Turing test to tell Computers and Humans Apart") code which has so far stopped any spamming of this facility. For added spam protection we suggest our customers do not publish their email address on their site. Obviously visitors need to be able to contact the site owner so we create custom contact forms which automatically email the site owner. By not have an email address visible automated site readers can not harvest email addresses to send spam to. Graecarth took this option and have had no problems. Obviously we supply an email address to our customers so that they may reply to their site visitors. If a customer already has an existing email address we can forward mail to their current address rather than giving them another.